Chabad will be hosting a full schedule of events during family weekend: Friday night services and dinner, Shabbat services and lunch and Seudat Shlishit. Yes, we would like to join in the family weekend festivities at the Chabad Center! 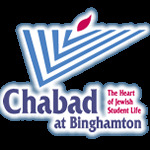 All are welcome and there is no fee, but contributions to Chabad of Binghamton are greatly appreciated and allow us to continue our vital work here.